Willimantic Street Fest is a true community event, organized and produced by a dedicated group of volunteers. 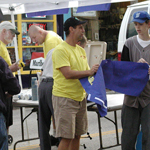 As a partner in the fest, the town of Windham provides street closing/cleaning and security. Local businesses generously donate funds and services. Community groups help with set up and break down. If you can donate time, funds or a service we are always very appreciative. We always need more Volunteers during each Fest and Organizers all year round. Thank you to all those involved in helping us towards our fest's wish list each year!